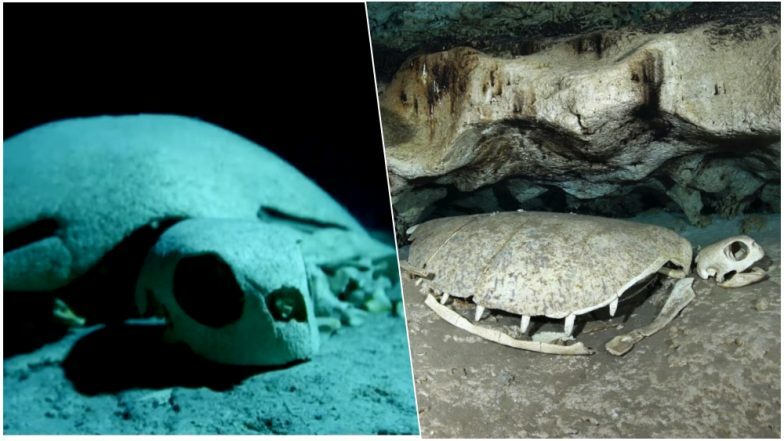 The ocean underwater have many new and mysterious creatures which still haven't been touched upon by science, but in a first, a graveyard was discovered of sea turtles. The island of Sipadan off the Malaysian coast is known for beautiful coral reefs. It leads into a network of caverns beneath the ocean waters but soon the beauty reefs disappear into the darkness to show spooky turtle skeletons. Known as the turtle graveyard, the Sipadan Island in Malaysia shows a lot of dead animals' skeleton on the bed of the ocean floor. The cave was first discovered by famous ocean explorer Captain Jacques Yves Cousteau back in the 1980s. How Did Turtles Get Their Shell? Ancient Fossil With No Shell Tries to Solve The Mystery of Turtle Evolution. The island of Sipadan is located off the east coast of Sabah, the oceanic island in Malaysia. This island has been formed by living coral reefs. The island took about years to develop and due to the reefs underneath, it is one of the richest marine habitats in the world. The island was also famous for turtle spotting. But how did it turn into a turtle graveyard? It was initially believed by Cousteau that sea turtles go to this point of the ocean to die peacefully. Seagull Snatches a Baby Turtle on 'BBC's Blue Planet Live', Leaving People Shocked (Watch Video). Not just turtle fossils, but some there are also remains of stillborn turtles. How all the turtles got here was a mystery. While sea turtles are known to migrate to long distance for reproduction, how did they all assemble to die at a particular spot was a question that came up. There was also no possibility of a mass drowning since turtles are capable of holding their breaths underwater. It was later revealed that the sea turtles perhaps entered the cavern to hide from their predators and rest. But the complex network of chambers disoriented them and they lost their way. The turtles went into the dark and could not escape, thus turning into skeletons and today known as a turtle graveyard! Dead Pregnant Sperm Whale Washes Off Italian Coast With 22kg of Plastic in Stomach (Pictures). They became the unfortunate victims who got lost in the complex caverns. The place is today also known as the 'Tomb of the turtles.' It is a dangerous diving spot even for the most experienced divers and only those who have proper diving equipment are allowed to venture here. It is a spot where underwater beauty soon turns into a spooky skeleton show. A place where one of the best ocean navigators met death, this is one of the underwater mysterious and dark secret.